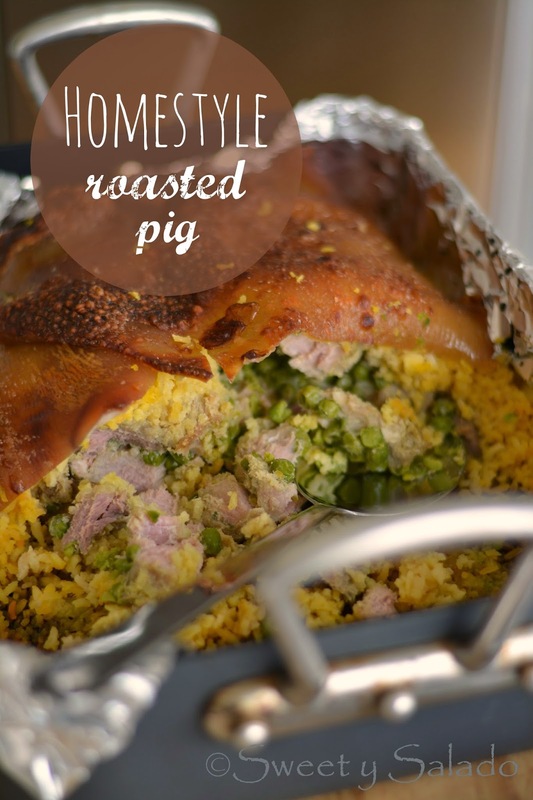 Another extremely popular dish that is made in Colombia during the holidays is lechona or stuffed roasted pig. Lechona is made year round, especially at different restaurants and even grocery stores like Carulla, but Colombians love to make it at home during the holidays. They usually buy a pig, kill it, and use the meat and skin to make lechona and Colombian sausages. I know is sounds rough and barbaric, but they have been doing it for years. Many times they also buy it from a reputable butcher that sells clean and ready to stuff pigs. At home I like to make a homestyle lechona with just a few pounds of pork skin for two reasons. For one, I don’t feel comfortable stuffing a baby pig at home having its face stare at me the whole time I’m filling it with rice and meat. I know it is completely hypocritical but I just can’t bring myself to do that. And the other reason is because a full pig, no matter how small, will feed between 30-50 people and at home it’s just my husband and I for the most part, so that would be way too much food for us to eat. One big piece of advise I have for you is to make sure you get a nice, extremely clean and fresh piece of pork skin (or pig if you’re making a whole pig). I’m talking from experience because using old skin with a nasty odor will turn your lechona into the most disgusting thing you will ever eat. Lesson learned! 1. In a food processor blend the green onion, white onion, cumin, food coloring, salt and pepper into a paste. If it’s too thick you can add a few tablespoons of water. Cut the pork meat into big pieces (optional) and then put it in a large resealable bag. Pour the marinade all over the meat, massage it to make sure it’s completely covered, seal it and leave it in the refrigerator overnight. 2. Rinse the pork skin with water and pat dry well. Season the underside liberally with salt to make the skin crispier during baking. Set aside. 3. Melt the pork lard in a large pan over medium heat, add the green onion, garlic, cumin, and food coloring and cook for about 2 minutes. Add the cooked rice and stir to fully coat it with the onion mixture. Season with salt and pepper to taste. 4. Preheat oven to 400ºF (204ºC). 5. Cover a large roasting pan with aluminum foil and place the pork skin inside the pan with the underside facing up and the excess skin outside the pan. Baste with the sour orange juice and then place one layer with ½ of the amount of rice. Then, place a layer with ½ of the amount of pork meat over the rice. Follow with a layer of yellow peas, another layer with the rest of the meat, and finally a layer with the last amount of rice. Fold the skin over the rice and pin it down with poultry pins or lacers. Baste the skin one more time with the sour orange juice and bake for 4-5 hours or until the pork skin is dark, golden brown and crispy. Make sure it doesn’t burn. 6. 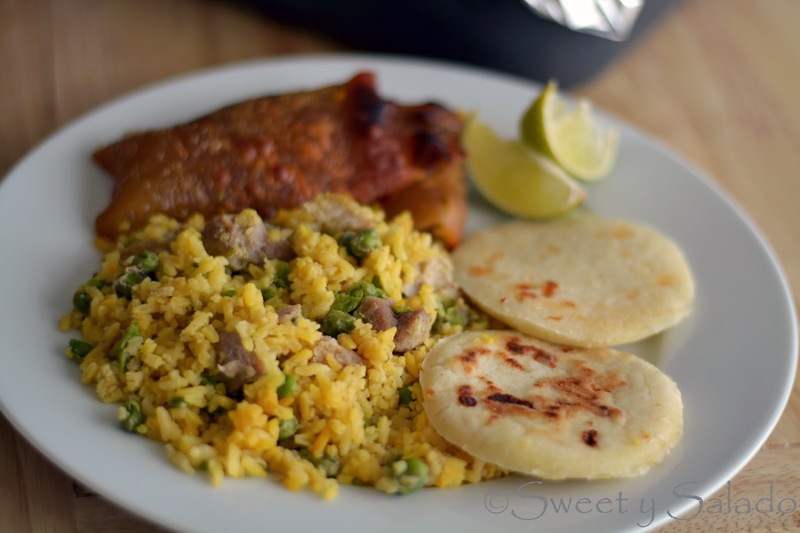 Let the lechona rest for a few minutes and then serve a portion of rice with a few pieces of pork skin, Colombian arepas and lime wedges. Hi! I was wondering if there was a way to make this without the pork skin? Like covering the dish with aluminum foil? Hi sugarrush, absolutely! You can put everything in a large baking dish, cover it with aluminum foil and bake it at 350ºF for about 1 – 1½ hour or until the meat is cooked through. 6 cups cooked rice + 2# meat does not sound like enough for 15 people!